The Native American story of Two Strike. Learn about the culture, stories, myths and legends of American Indians and their famous chiefs and tribes. A Native American Story of Two Strike to teach kids about Native Indians in a short, enjoyable, easy to read format. It is a pity that so many interesting names of well-known Indians have been mistranslated, so that their meaning becomes very vague if it is not wholly lost. In some cases an opposite meaning is conveyed. For instance there is the name, "Young-Man-Afraid-of-His-Horses." It does not mean that the owner of the name is afraid of his own horse—far from it! Tashunkekokipapi signifies "The young men [of the enemy] fear his horses." Whenever that man attacks, the enemy knows there will be a determined charge. The name of Two Strike is a deed name. In a battle with the Utes this man knocked two enemies from the back of a war horse. The true rendering of the name Nomkahpa would be, "He knocked off two." I was well acquainted with Two Strike and spent many pleasant hours with him, both at Washington, D. C., and in his home on the Rosebud reservation. What I have written is not all taken from his own mouth, because he was modest in talking about himself, but I had him vouch for the truth of the stories. He said that he was born near the Republican River about 1832. His earliest recollection was of an attack by the Shoshones upon their camp on the Little Piney. The first white men he ever met were traders who visited his people when he was very young. The incident was still vividly with him, because, he said, "They made my father crazy," [drunk]. This made a deep impression upon him, he told me, so that from that day he was always afraid of the white man's "mysterious water." Two Strike was not a large man, but he was very supple and alert in motion, as agile as an antelope. His face was mobile and intelligent. Although he had the usual somber visage of an Indian, his expression brightened up wonderfully when he talked. In some ways wily and shrewd in intellect, he was not deceitful nor mean. He had a high sense of duty and honor. Patriotism was his ideal and goal of life. "Why don't you tell him how you and a buffalo cow together held your poor father up and froze him almost to death?" Everybody laughed, and another man remarked: "I think he had better tell the medicine man (meaning myself) how he lost the power of speech when he first tried to court a girl." Two Strike, although he was then close to eighty years of age, was visibly embarrassed by their chaff. "Anyway, I stuck to the trail. I kept on till I got what I wanted," he muttered. And then came the story. The old chief, his father, was very fond of the buffalo hunt; and being accomplished in horsemanship and a fine shot, although not very powerfully built, young Two Strike was already following hard in his footsteps. Like every proud father, his was giving him every incentive to perfect his skill, and one day challenged his sixteen-year-old son to the feat of "one arrow to kill" at the very next chase. It was midwinter. A large herd of buffalo was reported by the game scout. The hunters gathered at daybreak prepared for the charge. The old chief had his tried charger equipped with a soft, pillow-like Indian saddle and a lariat. His old sinew-backed hickory bow was examined and strung, and a fine straight arrow with a steel head carefully selected for the test. He adjusted a keen butcher knife over his leather belt, which held a warm buffalo robe securely about his body. He wore neither shirt nor coat, although a piercing wind was blowing from the northwest. The youthful Two Strike had his favorite bow and his swift pony, which was perhaps dearer to him than his closest boy comrade. Now the hunters crouched upon their horses' necks like an army in line of battle, while behind them waited the boys and old men with pack ponies to carry the meat. "Hukahey!" shouted the leader as a warning. "Yekiya wo!" (Go) and in an instant all the ponies leaped forward against the cutting wind, as if it were the start in a horse race. Every rider leaned forward, tightly wrapped in his robe, watching the flying herd for an opening in the mass of buffalo, a chance to cut out some of the fattest cows. This was the object of the race. The chief had a fair start; his horse was well trained and needed no urging nor guidance. Without the slightest pull on the lariat he dashed into the thickest of the herd. The youth's pony had been prancing and rearing impatiently; he started a little behind, yet being swift passed many. His rider had one clear glimpse of his father ahead of him, then the snow arose in blinding clouds on the trail of the bison. The whoops of the hunters, the lowing of the cows, and the menacing glances of the bulls as they plunged along, or now and then stood at bay, were enough to unnerve a boy less well tried. He was unable to select his victim. He had been carried deeply into the midst of the herd and found himself helpless to make the one sure shot, therefore he held his one arrow in his mouth and merely strove to separate them so as to get his chance. At last the herd parted, and he cut out two fat cows, and was maneuvering for position when a rider appeared out of the snow cloud on their other side. This aroused him to make haste lest his rival secure both cows; he saw his chance, and in a twinkling his arrow sped clear through one of the animals so that she fell headlong. In this instant he observed that the man who had joined him was his own father, who had met with the same difficulties as himself. When the young man had shot his only arrow, the old chief with a whoop went after the cow that was left, but as he gained her broadside, his horse stepped in a badger hole and fell, throwing him headlong. The maddened buffalo, as sometimes happens in such cases, turned upon the pony and gored him to death. His rider lay motionless, while Two Strike rushed forward to draw her attention, but she merely tossed her head at him, while persistently standing guard over the dead horse and the all but frozen Indian. Alas for the game of "one arrow to kill!" The boy must think fast, for his father's robe had slipped off, and he was playing dead, lying almost naked in the bitter air upon the trampled snow. His bluff would not serve, so he flew back to pull out his solitary arrow from the body of the dead cow. Quickly wheeling again, he sent it into her side and she fell. The one arrow to kill had become one arrow to kill two buffalo! At the council lodge that evening Two Strike was the hero. 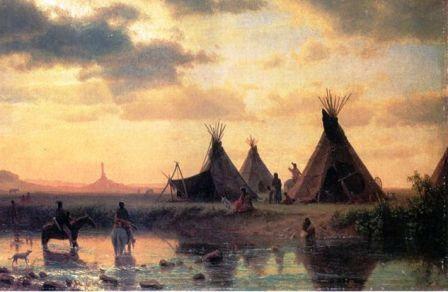 The following story is equally characteristic of him, and in explanation it should be said that in the good old days among the Sioux, a young man is not supposed to associate with girls until he is ready to take a wife. It was a rule with our young men, especially the honorable and well-born, to gain some reputation in the hunt and in war,—the more difficult the feats achieved the better,—before even speaking to a young woman. Many a life was risked in the effort to establish a reputation along these lines. Courtship was no secret, but rather a social event, often celebrated by the proud parents with feasts and presents to the poor, and this etiquette was sometimes felt by a shy or sensitive youth as an insurmountable obstacle to the fulfilment of his desires. Two Strike was the son and grandson of a chief, but he could not claim any credit for the deeds of his forbears. He had not only to guard their good name but achieve one for himself. This he had set out to do, and he did well. He was now of marriageable age with a war record, and admitted to the council, yet he did not seem to trouble himself at all about a wife. His was strictly a bachelor career. Meanwhile, as is apt to be the case, his parents had thought much about a possible daughter-in-law, and had even collected ponies, fine robes, and other acceptable goods to be given away in honor of the event, whenever it should take place. Now and then they would drop a sly hint, but with no perceptible effect. They did not and could not know of the inward struggle that racked his mind at this period of his life. The shy and modest young man was dying for a wife, yet could not bear even to think of speaking to a young woman! The fearless hunter of buffaloes, mountain lions, and grizzlies, the youth who had won his eagle feathers in a battle with the Utes, could not bring himself to take this tremendous step. At last his father appealed to him directly. "My son," he declared, "it is your duty to take unto yourself a wife, in order that the honors won by your ancestors and by yourself may be handed down in the direct line. There are several eligible young women in our band whose parents have intimated a wish to have you for their son-in-law." Two Strike made no reply, but he was greatly disturbed. He had no wish to have the old folks select his bride, for if the truth were told, his choice was already made. He had simply lacked the courage to go a-courting! The next morning, after making an unusually careful toilet, he took his best horse and rode to a point overlooking the path by which the girls went for water. Here the young men were wont to take their stand, and, if fortunate, intercept the girl of their heart for a brief but fateful interview. Two Strike had determined to speak straight to the point, and as soon as he saw the pretty maid he came forward boldly and placed himself in her way. A long moment passed. She glanced up at him shyly but not without encouragement. His teeth fairly chattered with fright, and he could not say a word. She looked again, noted his strange looks, and believed him suddenly taken ill. He appeared to be suffering. At last he feebly made signs for her to go on and leave him alone. The maiden was sympathetic, but as she did not know what else to do she obeyed his request. The poor youth was so ashamed of his cowardice that he afterward admitted his first thought was to take his own life. He believed he had disgraced himself forever in the eyes of the only girl he had ever loved. However, he determined to conquer his weakness and win her, which he did. The story came out many years after and was told with much enjoyment by the old men. Two Strike was better known by his own people than by the whites, for he was individually a terror in battle rather than a leader. He achieved his honorable name in a skirmish with the Utes in Colorado. The Sioux regarded these people as their bravest enemies, and the outcome of the fight was for some time uncertain. First the Sioux were forced to retreat and then their opponents, and at the latter point the horse of a certain Ute was shot under him. A friend came to his rescue and took him up behind him. Our hero overtook them in flight, raised his war club, and knocked both men off with one blow. He was a very old man when he died, only two or three years ago, on the Rosebud reservation. This story of Two Strike is featured in the book entitled Indian Heroes and Great Chieftains by Charles A. Eastman which was published by Little, Brown and Company, Boston in 1918. The Native American Indian Story of Two Strike provides an opportunity to read about the life and times of Native American Indians and many of their great chiefs and famous leaders. A Classic Short story about Two Strike for kids and children of all ages. This short story of Two Strike is great to read to kids and children at bedtime. This very short story contains folklore about the famous people of Native Indian tribes. This short Native American story has been selected to keep the attention of kids and children of all ages. Many of the traditional stories featured in this section are true and others are folk stories or myths and legends. Read our free short story online about Two Strike. Read a free, online short story about the people of famous tribes Native American Indians to increase knowledge and understanding of the indigenous people of North America. The Story of Two Strike. Discover the vast selection of pictures which relate to the Stories, History and Culture of Native Americans. The pictures show the clothing, War Paint, weapons and decorations of various Native Indian tribes that can be used as a really useful educational history resource for kids and children of all ages. 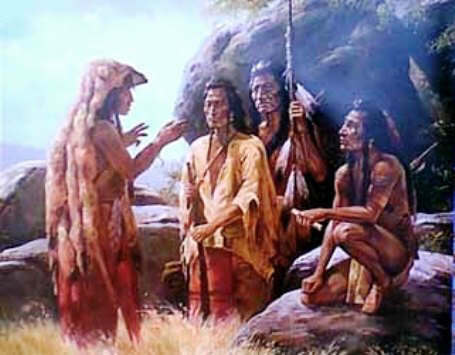 We have included pictures and videos to accompany the main topic of this section - The Native American story of Two Strike. The videos on this website enable fast access to the images, paintings and pictures together with information and many historical facts. All of the articles and pages can be accessed via the Native Indian Tribes Index - a great educational resource for kids.